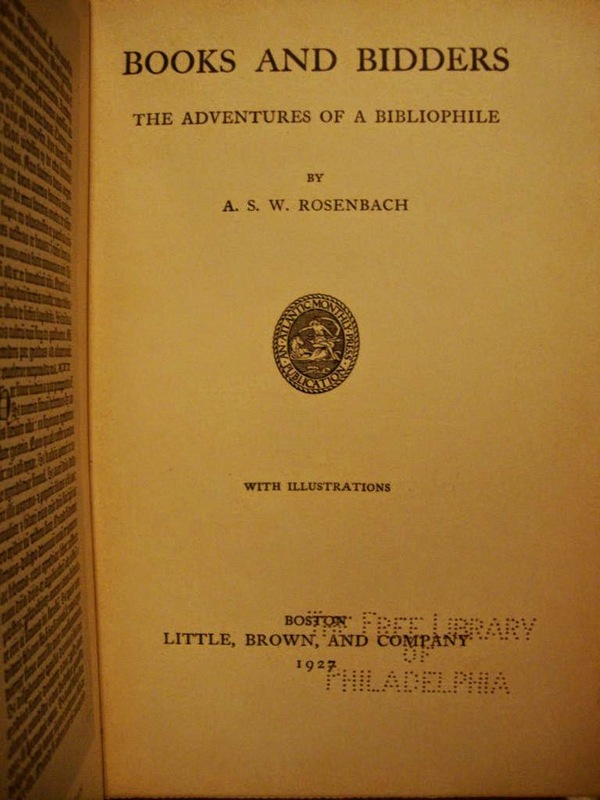 A contemporary and friend of Rosenbach was George Parker Winship (1871-1952), bibliographer, historian, rare book librarian, and teacher. Winship, shown in an early photograph with spectacles, goatee and mustache, oversaw and helped build the rare book collections at The John Carter Brown Library in Providence, Rhode Island (1895-1914) and the Harvard Libraries (1915-1937). Arguably his most lasting influence on the world of rare books was his class taught at Harvard, Fine Arts 5E. This rather informally structured class was designed to not only introduce selected students to fine books and printing, but also to promote the collecting of such books with the hopes the Harvard libraries would eventually benefit. And benefit they did. Future great collectors and bookmen who were inspired by the course included Arthur Houghton, Philip Hofer, Boise Penrose, and many others. 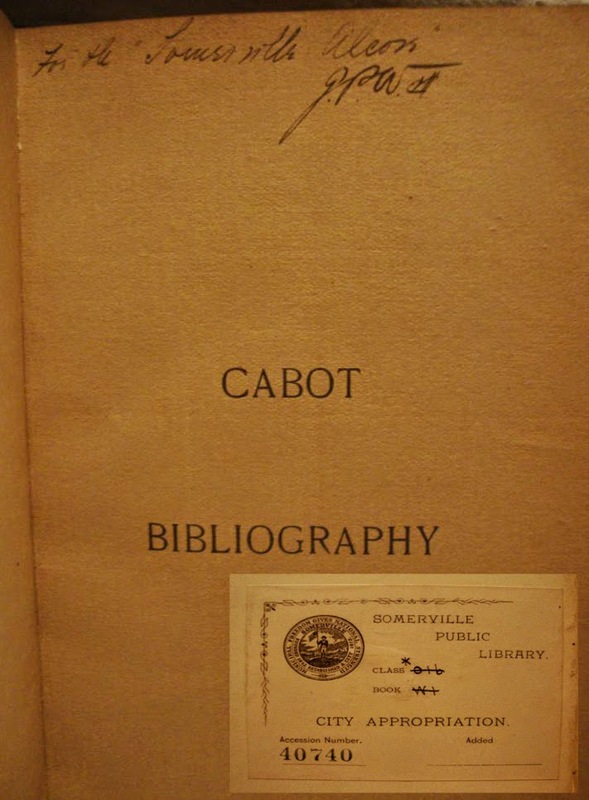 Winship’s first important bibliographic publication, Cabot Bibliography (1897), focused on the English explorer, John Cabot. Winship developed in his college days a keen interest in early American exploration and travel. The bibliography garnered praise and was published in 1900 in an expanded edition by the bookseller Henry N. Stevens, of London. I desired a copy of the 1897 first fruit, preferably inscribed. 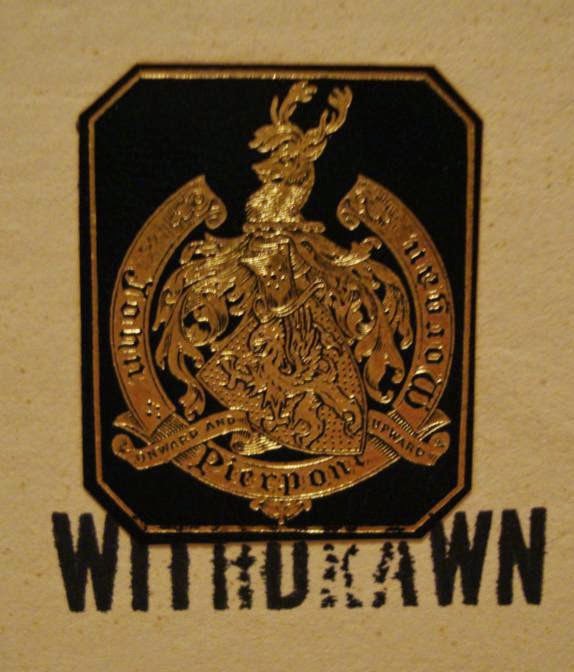 Winship himself in other writings noted only 60 copies were printed. Even by today’s internet standards this was a tough book. One eventually surfaced, an ex-library copy rebound preserving the original wrappers, with a brief inscription by Winship. The price was modest but my then ex-library bias made me hesitate. The inscription was also difficult to decipher from the photo provided. A couple of weeks later the bookseller discounted the book. I succumbed. The book arrived and I examined it closely—the contemporary half morocco binding was embossed “Somerville Public Library” (Massachusetts) with their bookplate and a deaccession stamp. The front of the original wrapper bore the inscription, “For the Somerville Alcove, GPW.” A splendid copy I held and knew not. Research revealed the fine association. Winship grew up in the area and attended Somerville Public High School. So, I held in my hands his first work presented to the local library where he undoubtedly spent many hours in the alcove reading and finding inspiration that would culminate in one of the great careers in books. Sometimes the ex-library provenance is multi-layered creating a complexity more normally associated with the passage of national legislation. My copy of Charles C. Jewett’s groundbreaking Notice of Public Libraries in the United States (1850) is such an example. Jewett (1816-1868) was one of the first important American librarians with a bent toward rare books. In 1848 he became the librarian and assistant secretary of the fledgling Smithsonian Institution in Washington D.C. Jewett was forward thinking, assertive, and energetic. He soon ran into opposition from his boss, Joseph Henry. Jewett advocated developing the Smithsonian into a great reference library, a focus Henry did not share. The conflict eventually boiled over and Jewett was dismissed in 1854. Undeterred, he assumed the head of the Boston Public Library where his innovative organization of the library was influential and much copied. He became friends with prominent booksellers and book collectors and went on extended book buying trips to Europe in search of library acquisitions. Jewett’s Notice was the first large-scale overview of public libraries in the United States. Jewett details the history and holdings of libraries large and small. He goes the extra page and records what we would now call “special collections” held within the most important libraries, such as the Library of Congress. The work was originally issued as an appendix to the Smithsonian Report to Congress published at the request of the House of the Representatives and Senate. It was issued shortly after in separate form. Either format is very scarce in commerce. I purchased a copy of the original appearance from a bookseller offering hundreds of miscellaneous deaccessioned books and pamphlets from the Library of Congress. Jewett’s Notice was bound with other reports in a volume of contemporary calf stamped on the spine “Senate Chamber.” It is a fine, stately copy befitting its provenance. 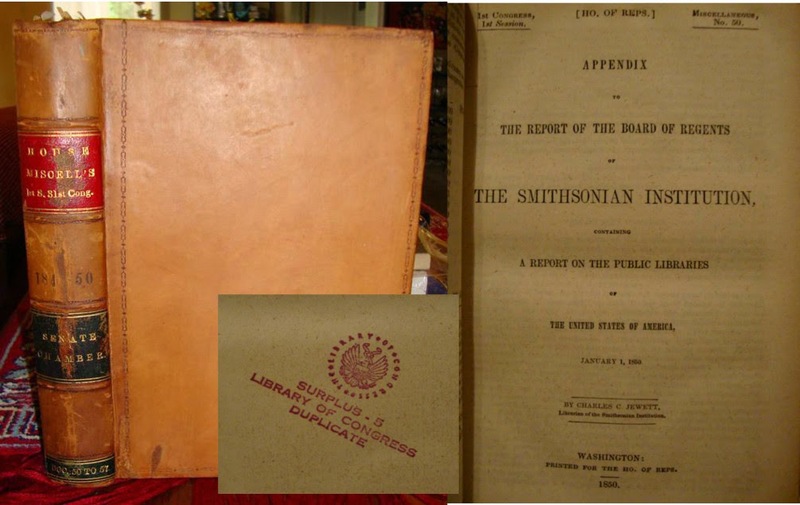 So here we have the first important report on American libraries, from the greatest American library of all, the very copy of the Senate that was partly responsible for its publication. It pleases me to contemplate Jewett’s gem formerly on the Senate library shelves surrounded by the never ending swirl of politics, power, and intrigue. Often a daydreaming collector will conjure of particular books and associations that may actually exist but which are simply not available for purchase—or so it would be thought. My musings centered on J. Pierpont Morgan (1837-1913) and Robert Hoe (1839-1909), two of the mightiest book collectors of them all. Morgan, titan of industry and finance, gathered his well-known collection that eventually culminated in the establishment of the Morgan Library in New York City. Robert Hoe, printing press manufacturer, contemporary of Morgan, and fellow New Yorker, built the greatest all-around private collection of books ever formed by an American. Hoe, a founding member of the Grolier Club, began collecting earlier than Morgan but the latter’s vast wealth helped even the game. Wouldn’t it be nice to own an association item linking these two book barons? I’ve found no evidence that the men ever shared friendly book talk over drinks but they were rivals and at times crossed swords in the collecting arena. One common thread in their varied bookish interests was their mutual love of fine bindings. Both libraries abounded in supreme examples. Luck favors the prepared collector and in the year 2000 the Morgan Library, prior to a major remodeling, deaccessioned a substantial group of books focusing on printing, bindings, and bibliography. The library had received earlier a collection of such material from Julia Wightman, collector and Morgan benefactor. The library retained many of her copies and let go of some original Morgan books in the process. Bids were solicited by the library from dealers and the books sold into the trade. Soon, I started to see items with Morgan provenance offered for sale. I bought a few that appealed to me but found none with the hoped for Hoe—Morgan connection. I emailed a general enquiry to one of the dealers involved, “Anything by Hoe in stock?” I asked. Robert Hoe published little so the odds were slim but not impossible. 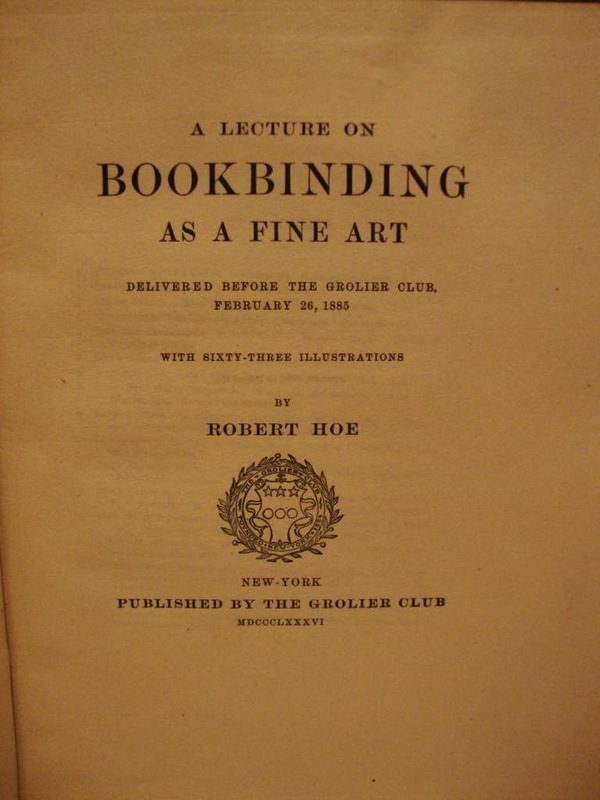 To my surprise, I was offered two copies of Hoe’s A Lecture on Bookbinding as a Fine Art (NY: The Grolier Club, 1886), published in an edition of 200 copies. Hoe’s witty and learned essay is handsomely illustrated with reproductions of sixty-three bindings, almost all from his collection. The first copy offered was in nice condition with no particular provenance. The second bore Morgan’s bookplate and some minor library markings, priced considerably less (!!) because of its official ex-library status. You don’t need to guess which one I purchased. The book is next to me now. I open it and wonder if Morgan held it also, perhaps taking a brief respite from the monopolizing of an industry to read Hoe’s essay and to admire the bindings reproduced—a number of the very books purchased years later by Morgan shortly before his own death at the auction of Hoe’s library in 1911-1912. These books described, all orphaned by circumstance and chance, have been adopted by me because of their sentimental appeal. Each give a taste through their stories of how the normally dismissed ex-library book can be better appreciated. Traditional biases and tightly-bound thinking sometimes constrain the imagination to the point where opportunities are missed.